RAP RAP RAP RAP RAP! Who the bloody hell is that. I told them I was going for a lie down and I’ve just managed to nod off. It’s been that kind of a day, when you don’t feel guilty having a lie down at ten to six in the evening. “Le professeur d’Anglais est ici,” says the voice through the door. An English teacher here? 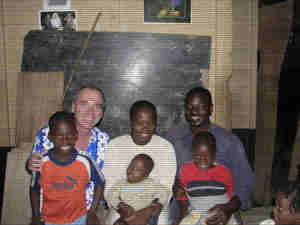 In Ndende (the now famous Ndende, Gabon, the bogey town that some thought I would and should never reach. That Ndende). I go to the bar where a jolly little fellow stands up and extends his hand. He steps aside and presents a group of smiling 20-something students in uniforms sitting in the corner drinking pineapple sodas. ‘ be delighted. It’s the most English I’ve heard on the Brew Ha Ha for an age. Tati, for that is his name, chooses his words with care and enunciates the words a, little, too, clearly, but it’s a joy, all, the, same. “Tea, of courrrse,” he says. The students are shy and are happy for me to rattle on about everything and nothing in particular for a while and when they discover I am an English teacher (in northern Africa I pretended to be a social worker but that took too much explaining!) I get the third degree on the English education system. Tati is terrific and must be a great teacher, an enthusiastic joy to have around but who has a habit of re-emphasising every point I make with seriousness and with care as if it was an opinion he has long held but had somehow neglected to mention it (“Yes, I’ve often felt that …That’s true, so true … O, yes I agree”). This is great stuff, everybody’s engrossed although I’m not sure they can all keep up. But that’s obviously not the point. After taking some pictures of themselves and me on the bike with their mobile phones we stroll back up to our drinks where the African Cup of Nations has got the whole bar gripped. “They won’t know who he is,” he gestures to his students. That should keep them all busy until the next Englishman drops by. 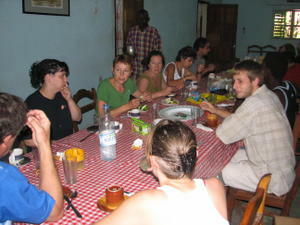 January 27 Ngoma Serge Dimitri pushes the plate of ten raw sausages across the table towards me. I look down at the ten sweaty pink fingers he has just unwrapped, still partly frozen. I look back up at Serge, his wife, and eight – yes, eight – children staring at me, all wondering how an Englishman eats his sausages. Serge’s wife Lyda is sitting on a bench with a crowd of children and cradling a new born in her arms (a beautiful black doll in a woolly jumpsuit who came into the world since my last visit to Mouila) and she doesn’t look in any fit state to be making fires for sausages. I drink the last of the warm tea mixed with powdered milk and hope someone will change the subject. He digs into a bag and places on the table a plastic bottle of long life milk. The words coming out of my mouth sound so unkind. O, Serge, Serge, I wish you hadn’t. Serge, the nurse who (luckily for me) was on duty the afternoon of the accident seven weeks ago, the one who brought me food in the hospital, the one who took the time to find out why I was hurting so much, the one who ran down to the pharmacy for medication, the only one who could lift me up from the bed without excruciating pain, the one who dressed the wounds, the one who walked with me in the deluge to the police station to seek help retrieving the bike, the one who was man enough to admit (as nobody else would) that I needed more professional help and that it was important I went to a hospital with more facilities in Libreville. I invite myself for tea and you go and blow the weekly food budget on a packet of frozen sausages and a bottle of milk which stare back at me accusingly. I'm sorry. The two teabags, which I suspect have been borrowed, have now been used and I’m feeling a sickly wave of guilt – and the Brew Ha Ha is not meant to leave you feeling guilty. But Serge, for all that you have done, and for making this part of the journey unforgettable, the Brew Ha Ha salutes you. Within 10 minutes an air conditioned 4X4 arrives to take me to the home of Madame Marie-Hélène Mathey Boo in downtown Libreville. The traditional rouge with vegetables was obviously kept on warm while waiting for me but the food doesn’t look as if it has suffered at all, and I can barely wait to tuck in. The cook serves the rice and then the fish dish to each of us in turn: myself, then madame sitting at the opposite end of the table, then her assistant Christy on my right. The dining table is formally laid out with table-cloth and linen serviettes, heavy cutlery and shining porcelain, water and wine glasses (“yes please, why not”). It is surprising to me (who is not, admittedly, always the most formal individual) how pleased I am at such a simple thing as a laid table, a courtesy that has not been shown since visiting the Zim farmers of Shonga. I know how that sounds. Weird. Marie-Hélène is instantly likeable. Some people just are, and others take time to warm to; my guess is she has lots of friends. She is director general of the Centre International des Civilisations Bantu, or CICIBA if you happen to notice the personalised registration plates on the three new 4X4s in the driveway. The organisation is a cultural focus for 11 Bantu-speaking countries spreading from west to southern Africa. Until very recently Marie-Hélène was the DR Congo’s ambassador in Gabon, which she happily admits, apart from the perennial refugee problem on the border, was a very taxing round of cocktail parties, golf dates and networking opportunities. Marie-Hélène’s home accentuates the love for her family – two attractive sons and grandchildren who live in Kinshasa and Brussels – with cheerful photographs lining the walls of holidays and good times past. Lunch barely seems over when madame excuses herself and says she has to prepare for a meeting and her professional assistant will look after me. Christy, quiet until now, has a fair command of English (and you can’t underestimate the importance of that on a lunch date) and wants to talk about everything from the DRC to life in England, from Bantu history to black magic. 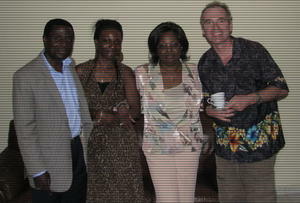 I learn more from Christy in an hour than I have in the whole previous month in Gabon. But madame has disappeared and I’m not sure whether it would be polite to leave before her return or hang on in case she walks in the door at any minute, and we haven`t had tea yet. In the meantime a visitor who has an appointment arrives at the house and says he will wait for her return. Henri Tchikaya is an animated individual who uses his entire upper body to stress his points, whether serious, comical or flirtatious, which makes his conversation compulsive viewing, even for somebody who can barely understand a word he says. Madame returns and her household assistant serves tea, five hours after I was brought to the house. 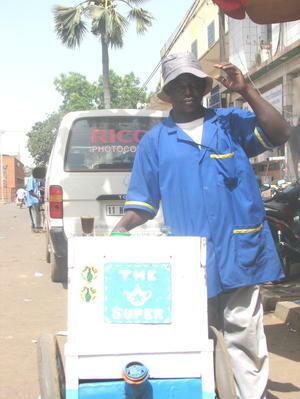 November 14 There were a few mobile tea sellers doing a fair trade with the hot and sweaty workers in downtown Ouagadougou, Burkina Faso. I tried some of this chap’s brew after I spotted his wagon was called The Super Allah 1. If he is planning to branch out with Super Allah 2 and Super Allah 3 he will have to improve the taste of his cuppa (or glass, as you can see in the pic) but I wish him all the best. November 1 Criticism of the President of The Gambia is not done lightly within the country, in fact it’s rarely done at all. My Tea Encounter was scathing about the current regime and of President Yahya Jammeh in particular. Jammeh is doing his best to cultivate a personality cult with huge banners and posters of himself throughout the capital Banjul proclaiming all the apparent successes since he came to power in 1994: “13 Years of Peace and Prosperity”, “Healthcare Our Priority” etc. But still many people who criticise the regime find themselves arrested on trumped-up charges and spend long periods in prison while others ‘disappear’ for holding dissident views. When human rights organisations enquire about their well-being the government say they ‘can’t find them’. For this reason my Tea Encounter cannot be identified; I’ll refer to him as George. George said: “A little learning is a very dangerous thing. When you have a high school graduate for a president running the country, it’s going to be a disaster. The whole country is corrupt, from the government to the hospitals to the policemen at the checkpoints you have to ride through. Nepotism and tribalism is killing Africa. A very few have a lot, while most of the people live in poverty. A tourist guide book refers to The Gambia as “Africa for beginners” but the throwaway nickname, the benign exterior of the population and the international holiday resorts conceal a different story – one of repression and Autocracy. Our tea together is cut short when we have to rush to the police station to try to release his cousin who is being held on false charges relating to his involvement unearthing minister-level corruption in the government. George suggests I stay in the car outside “otherwise the police will think you are a journalist and get jittery, it will only make matters worse”. George posts bail and is optimistic that his cousin will soon be released but it is another reason for him to be exasperated with the poor human rights and lack of due process in his country. It seems democracy is a long way off for George and The Gambia. "With courage, you will conquer your journey." November 24 We both drink the last of the tea from the flasks, wheel the bikes out of the restaurant where they took pride of place the previous evening, and take them down to the corner where the posse of boys are washing cars and bikes on this hot, sticky morning. Tabot warns them that if he finds any mud on my bike after they have finished we won’t pay them a penny. They quickly go to work, each fighting over who will wash the Triumph even though it is twice the size of Tabot’s ‘Grande King 125 Made in Taiwan’. We sit back on the bench and watch the boys rinse off the worst of the caked-on mud with a hose before starting with the huge soapy rags. The church with no windows next door is getting into song, filling the run-down neighbourhood in Kumba with a joyous, and occasionally rapturous, sound, adding a poignant coda to the atmosphere. Tabot is now fielding questions about the bike from the crowd that has gathered to stare and check out the “White man, white man”. His pidgin-English is very difficult to follow but I can tell what the subject is because he has no substitute for “England” “Eight thousand miles” “South Africa” and the answers to the most popular questions “Eleven thousand euros” and “One hundred and forty miles an hour”, which usually brought gasps of amazement. The lazy Sunday morning crowd make me mock offers for the bike and slap each other’s backs with laughter as they get a positive response or an offer of a trade-in. The fact is, I would have taken the trade-in for a lighter bike at any time during the last few days as Tabot and I struggled to bring the heavy Triumph through the Cameroon jungle, a journey which I had estimated would take a few hours but had taken four and a half gruelling days. The original deal was for Tabot to guide me from the frontier through the worst of the pot-holes to the nearest big town. 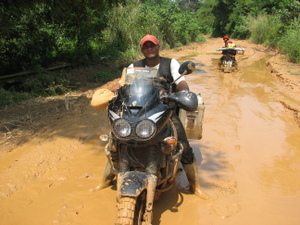 But the ‘road’ from the Nigeria border at Ekok to Kumba was a quagmire. Even the border police on both sides of the frontier were concerned that I was taking the route alone. With courage, yes, but also with Tabot’s blind optimism and astonishing ability to find solutions to difficulties long after I had given up. Armed with little more than a pair of Wellington boots and a charm that could win wars, he used his wits to make sure this part of my journey would succeed. Now sitting in the shade with the soapy water draining around our feet, I knew the most physically demanding few days of my life was over and the muddy evidence was now being washed away before us. A perverse thought crossed my mind. I wanted it to continue. “Are you sad, too?” I asked, without taking my gaze from the bikes. "Yes, I am sad, too. It is over. If I could, I would continue with you to the border of Gabon to make sure you are fine. You must go on with your journey. You had courage and you have succeeded. " November 18 A typical colonial Sunday afternoon tea party - the sort of thing I deluded myself into believing might be served throughout Africa: four different cakes including pumpkin pie and a creamy sponge; tea or coffee with milk and sugar; the kind of generous hospitality that is so valued by the traveller. Three white African couples, all farmers, are meeting after church to talk about the harvest, their plans for the future, and the imminent arrival of fresh livestock. But my hosts are no ordinary farmers on an ordinary farm. Three years ago Dan and Jenny Swart were helping to make Zimbabwe live up to its soubriquet as ‘the bread basket of Africa’. That was before Robert Mugabe’s thugs, risibly known as the ‘war veterans’, moved in and threw them off their farm with just enough time to pack a few things and leave before things got ugly. Their farm was taken over by an army general with no farming experience who, bizarrely, hired a Chinese manager to run the operation. It is estimated the current production is at around 15% of the Swart’s output. After some time treading water in the Zimbabwe capital Harare, the governor of Kwara state in Nigeria, hearing of their plight, decided to introduce commercial farming in his state. Who better to call on than some recently dispossessed farmers with the knowledge, expertise and know-how that was lacking amongst his rural communities. It is thought that Mugabe responded to the offer angrily by claiming Nigeria was stealing his farmers. The Nigeria experiment is a pilot project that is attracting attention from other Nigerian states and from other African countries. Thirteen Zimbabwean families have now started a new life thousands of miles from the lives they knew but still on the continent they love. Astonishingly, they still have ambition, drive and the will to succeed even though everything they worked a lifetime to achieve was taken from them on the whim of an African dictator. It is astounding how much Dan and Jenny have achieved in three years. They have cleared and planted 1,000 hectares of mainly cassava and maize, with bananas and mangos, and will soon begin producing fresh milk at the dairy Dan is building from scratch – the first in the region – when the cattle arrive. They also have a comfortable home, which they built, from where they entertain passing bikers. 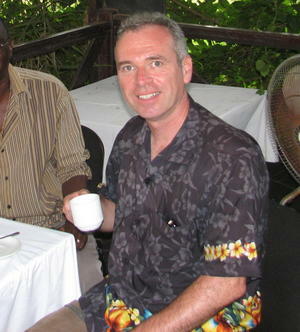 The previous evening I had turned up at their door in darkness with the lame introduction of: “I’m travelling through Africa meeting people for tea. Some people I met in Mali suggested I visit you.” The words sounded ridiculous as they came out and I now cringe to think of it. But 30 seconds later I had a beer in my hand and an offer to do my laundry. It was a reflection of how I must have looked: soaked through from the sweat of the day’s ride and covered in sand after two offs, one high speed, on the track up to their farm. Two hours before arriving I had read an email from the African Surfers (who are travelling in the opposite direction to the African Brew Ha Ha) who had spent a few days with some of the Zim farmers a few weeks before. Their email gave approximate directions to the nearest village, Shonga. It seemed a good omen. He immediately stood up, leaving his girlfriend who was waiting patiently for him, and lead the way. “It is maybe one hour.” He guessed. And it was a guess. With stops for fuel and to ask directions, wrong turns and the two offs it took me more than two hours to reach the farm. But I’m so pleased I did. The cry came from among the crowd of about 50 children coming out of school who had quickly attached themselves to me and the bike. I had asked if they knew of a place I could stay and after blank, worried looks all round someone came up with the brainwave of positing me at the home of the Baptist minister not far from the school. I soon found myself chasing the cheering, screaming kids across open ground, past the church to the pastor’s house. Whatever happened next I knew I would never forget this reception. It was like a scene from a St Trinian’s film with children swinging books and bags with abandon and the joy that only comes at Friday going-home time and the arrival of a strange visitor on a Triumph. Kids rule. I had struggled on appalling roads from the Benin border for three hours but finally I had to admit to myself I would not reach the nearest town before nightfall. The sun had set and I had a precious half hour before dark to get shelter for my first night in Nigeria. 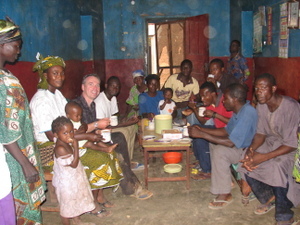 Luckily I stopped in the small village of Boriya and the kids came to my rescue. I stand up on the foot-pegs now, off-road fashion, and the kids love it, screaming with glee and slapping the bike as it makes its way over the uneven surface. “He’s going to fly,” someone yells. I increase the pace and the children run as fast as their legs will allow, yelling and cheering all the way. The crowd of children is beginning to swell as older children and adults from the village quickly catch wind of the visitor and come to see what the fuss is about. As I approach a run-down house set back from the dirt road, a young man in a white tee shirt and ill-fitting trousers comes out on to the verandah; he is followed by a woman holding a young child to her breast. The crowd, which has swelled to around a hundred by this time and silent during this short exchange, now erupts into cheers and laughter and everyone insists on shaking my hand to welcome me to the wonderful village of Boriya. November 12 I thought I had the police checkpoints sussed. I must have passed through at least 100 on the African Brew Ha Ha so far; if they want me to stop the barrier is down or the oil drums are laid out across the road - pass a little light conversation, mention the football, say how much you enjoy their country "the best country in Africa so far" and on I go. Or I slow down, wave like a maniac until I catch someone`s attention, and I get waved through. Approaching the checkpoint near the Mali frontier with Burkina Faso an irrascible gendarme took exception to my passing the oil drum a la gauche instead of a la droit. In fact he nearly had a fit. "You pay three thousand. This Mali, Mali, Mali, no England." I look back and see that I pulled into the Poste de Controle on the wrong side of his blessed oil drum. There is not another vehicle for miles around apart from a 4X4 full of white people and the gendarme`s bicycle so you could hardly call it dangerous driving. He demanded my driver`s licence ("British Citizen" he read as if he was spitting out unwanted medicine) which he quickly pocketed. This was going to take some time, so I took the time to cool off, have a drink, put on my "I`m sure we can work this out, officer" look. After 20 minutes of negotiations, buttering up, flattery and his surprising invitation to take tea with him, he gave me back my licence, shook me warmly by the hand, told me to ignore the fine, and wished me bon voyage. Put that one down to the power of tea. November 2 Arrive at the roadside settlement of Koussanar hoping to find a small hotel. People in the previous village told me there would be one here but I got the same story in the two previous ones also. Maybe they just didn`t like the look of me and thought it best I move along. No hotel. Night is falling and I decide it`s too risky to continue because of the state of the road so I just wait for someone to come up with an idea. 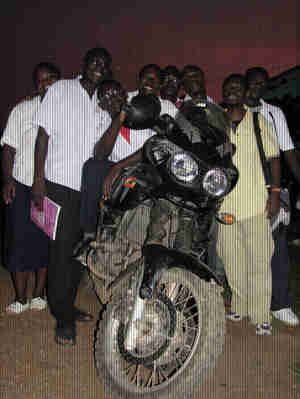 You`re never short of ideas in Africa. A small boy gets on a bicycle and tells me to follow him. He leads me to a small compound with costumed women cooking outside and kids playing within earshot. One woman speaks a little English and says the centre is full "because the French" but I can stay if I sleep outside and she will feed me. Soon, around a dozen visitors from Saint Cyr sur Loire in France arrive and explain that their town has a twinnng arrangement with Koussanar. 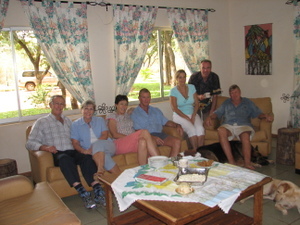 They built the compound for their own visits and so the locals can use it as a bed and breakfast when it suits them. They are here to welcome and unload a container they have sent from France containing medical supplies to set up a children`s clinic in the village. Unfortunately the container is delayed in Dakar for two reasons: although all the paperwork is complete the customs will not release it; and the local prefecture (administrator) won`t give his approval until the French leave so that he can get all the local glory going when they have returned to the Loire. Needless to say, the French are extremely frustrated and there is a heavy air of disappointment and incredulity in the air. They have all taken a week off to come to this God forsaken place - and no container. The friendly group of teachers and students do not seem to have an agenda - they are not missionaries or from an NGO - they are just people who want to help some people in need, and even that joy has been denied them. After tea with breakfast I leave them all to walk around the village again, play with the kids, kick the dust and generally waste their time.